Genetic counsellors are healthcare providers with a Master’s degree in genetic counselling or equivalent training and proven competence. 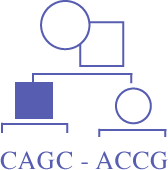 Genetic counsellors working or trained in Canada are encouraged to belong to the Canadian Association of Genetic Counsellors, our recognised professional body, and to maintain CAGC Certification. Genetic counsellors are expected to act ethically in all professional relationships and to be aware of the guidelines herein and the principles on which they are based. Each genetic counsellor has responsibilities to patients, to colleagues, to society as a whole, and to her/himself.